This January is the first time I heard the term “Blue Monday” attached to the third Monday in January, “officially” the most depressing day of the year. Apparently, the cold weather, short days and post-Christmas come-down combine to make January particularly depressing. Not for me. I had a fantastic day. Inspired by the beautifully clear and frosty sub-zero temperatures, on Monday 16th January 2012 I decided to walk the entire route of the Sheffield Round Walk. I live close to Meersbrook Park (above), which is on the route, and am lucky that the 14 mile circular route brings me back home. Sheffield Round Walk connects several parks, green spaces and woodlands in the southern part of the city, and takes you all the way out to the edge of the Peak District at Ringinglow. It’s a full day’s walk and it’s best to do it on a long Spring or Summer day, rather than in the middle of January, so that you can stop a bit more than I did. 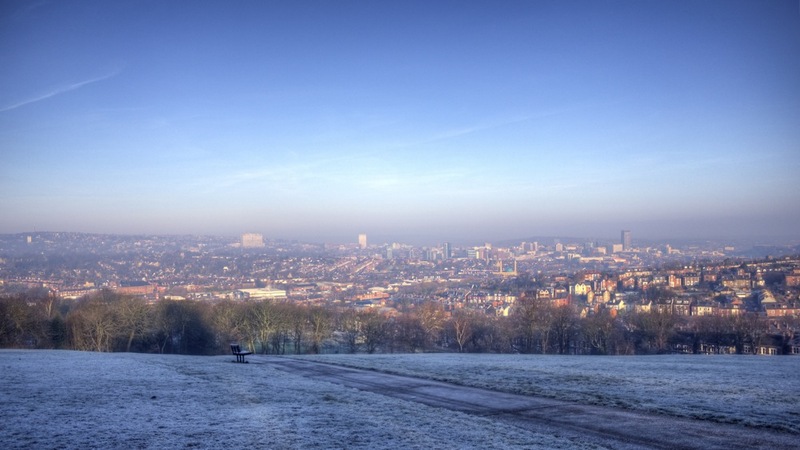 Sheffield is widely known for being built on seven hills (like Rome), and as England’s greenest city. It is also famous for the highest stay-on rate for university students moving here to study, and you can see why. I’ve done the Round Walk many times before but never in such amazing weather conditions. Here are a few high dynamic range (HDR) photos of my walk. There are more photos of Sheffield and many other places on my Flickr account. There are maps of the Sheffield Round Walk route on the official website, and a guide book can be ordered from there too. In no particular order, here are just a few of my other favourite things about Sheffield. Sheffield Live! 93.2 FM community radio station – number 1 slot on my car radio. Sheffield Contemporary Art Forum – an umbrella organisation promoting the fine art scene in Sheffield, which has the largest number of artist’s studios outside London. Peak District National Park – Britain’s first National Park. Over 500 square miles of moorland, hills, woodland and dales. Showroom Cinema – the second largest independent cinema in the country and one of the few cinemas still showing both digital and film formats. Sheffield Theatres – the largest theatre complex outside London, including The Crucible, one of the world’s finest thrust stages. Tramlines Free Music Festival – winner of the Best UK Metropolitan Festival at the UK Festival Awards 2011.